A cabinet secretary for the New Mexico Department of Corrections remains one of the few holes in Gov. Michelle Lujan Grisham’s leadership team as she approaches the end of her fourth month in office. Alisha Tafoya Lucero was named interim Corrections secretary on April 9. The fits and starts in the search for a permanent leader at Corrections has left Melanie Martinez, deputy director of the Adult Probation and Parole division, as Lujan Grisham’s “point person,” largely running the department since January, officials told New Mexico In Depth last week. But on April 9, the new governor moved to shore up the top spot at one of the state’s largest departments — at least temporarily. 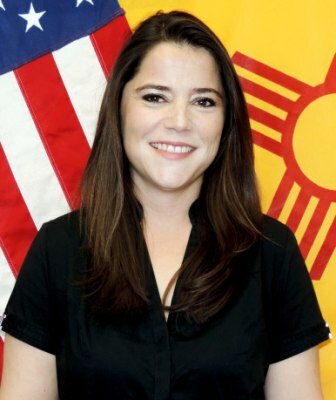 That’s when she named Alisha Tafoya Lucero to not one but two new positions: deputy secretary and interim cabinet secretary. Lucero has been with the department since 2001, working in nearly every sector of its vast bureaucracy. She began her career as a case worker at the Penitentiary of New Mexico in Santa Fe, then moved on to positions in the field and in the reentry program of the Probation and Parole division. Lucero also has run two of the department’s prisons — the Springer Correctional Center and the state prison in Santa Fe — as a warden. “I’m a native New Mexican and a Santa Fean trying to make a difference for the people I care about,” Lucero told NMID in a telephone interview last week. Meanwhile, Lujan Grisham administration officials have been interviewing candidates for nearly two months, since Jones backed out. Dozens of applications have come in from people working in the Corrections Department, elsewhere in New Mexico and outside the state, officials said. About 20 have been interviewed, and the administration has no timeline for when a permanent secretary will be in place. For now, Lucero is leading one of the largest departments in New Mexico state government. Its budget is just south of $340 million for the current fiscal year and, after a bump from the Legislature during the recently completed 60-day session — mostly aimed at transitional living for people being released on probation and parole — will operate on a budget of more than $354 million for the 2020 fiscal year. Lucero and Melanie Martinez said it’s too early to detail the primary issues facing the department. Both said they’re working a list of priorities for the weeks and months ahead. One problem is crystal clear: a staffing shortage. “Corrections nationwide struggles with vacancies, so that’s one of our priorities,” she said. Since January, Corrections officials have been eyeing changes to the department’s screening and recruitment recruitment strategies, including an outreach program to look for employees in the state’s rural areas. Melanie Martinez stressed that the Corrections Department has not been a rudderless ship since Lujan Grisham took office, noting that Jablonski and former deputy secretary Amy Orlando were the only two high-level departures when former Gov. Martinez left office. Clarification: This story originally said Alisha Tafoya Lucero had been warden at the now-closed Springer Correctional Facility, which housed juveniles. In fact, she was warden of the Springer Correctional Center, which houses adult inmates and is still open. Gov. Michelle Lujan Grisham has vetoed a set of reforms to the state’s probation and parole systems that would have, among other changes, reduced the number of “technical violations” that could land someone back behind bars and required the Parole Board to detail denials for those sentenced to 30-years-to-life who are seeking release. The move comes after state Attorney General Hector Balderas and New Mexico’s 14 district attorneys pushed back against the bill in a letter to the governor as this year’s 60-day legislative session came to a close last month.